All Sunday Middle Fork 1-Day rafting trips during the month of June are currently on Rapid Deal Discount for 25% off. Check out full list of all Middle Fork Rapid Deals. Save 15% off any South Fork or Middle Fork American trip during the 2015 rafting season if you book by the newly extended deadline – Friday, July 31st at 6PM. Learn more. This 16-mile ribbon of crystal-clear river holds a special place in our AO hearts. 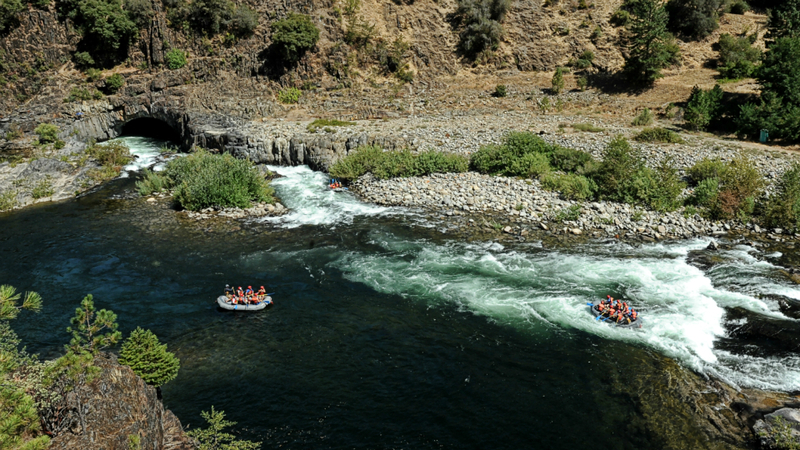 From the exciting hydraulics and drops of the Class IV rapids, to the meditative calm of the middle section this river, the Middle Fork has all of the beauty and charm of a world-class whitewater adventure. We offer 1-Day trips that cover the whole length of the river in about an eight-hour day, as well as multi-day trips for those looking to slow it down and embrace the river life. Our multi-day trips allow for more time to take it all in – a slower pace on the river, hikes up side canyons, and a night or two of wilderness camping under the stars while the guides prepare all the meals. An added bonus on the 2-Day and 3-Day Middle Fork trips: inflatable kayaks in the calmer sections. Extra excitement and entertainment for all guests on the trip! The Middle Fork is considered an Intermediate Class III-IV river that is appropriate for returning rafters, as well as athletic and adventurous first-timers. Everyone must be able to swim and the typical minimum age is 12 years old. While this river canyon feels like a total escape from the hustle and bustle of normal life, it’s really not very far away! With our meet location in the town of Foresthill, this river is just under one hour from the California capitol of Sacramento and just over two hours from the city of San Francisco. Learn more about the Middle Fork American and the trip options available. See you on the Middle Fork!